Super Smash Bros. Ultimate is out now, but Shacknews' Ultimate Character Profiles continue! Next up: The mysterious warrior from Ocarina of Time. The time is here! Super Smash Bros. Ultimate is now in stores. After almost two decades, Ultimate is the culmination of the franchise, bringing together every single fighter from every Smash Bros. game so far. The game may be out in the wild, but with so many characters to choose from, Shacknews remains committed to taking a look at each and every one of the Super Smash Bros. Ultimate characters individually. And we will continue to do so beyond the game's big release. Today, we look at another side of one of the staples from The Legend of Zelda. Sheik's role in the Zelda franchise is indeed quite legendary. This character was only in one game, The Legend of Zelda: Ocarina of Time, acting as a guide for the adult Hero of Time version of Link. Sheik proved to be a capable warrior, able to fight off Ganondorf's forces and dispel the forces of darkness throughout Hyrule. Sheik's identity was ultimately revealed near the end of the game, with players learning that it's actually (spoiler alert for a 20-year-old game) Princess Zelda in disguise. The Sheik guise would debut in Super Smash Bros. Melee, appropriately enough as Princess Zelda's alter ego. Once transformation characters went out the window with Super Smash Bros. for Wii U/3DS, Sheik was given a chance to stand out on her own and proved to be even more of a dynamite character on her than she was as a tandem. While the Sheik character is fading more and more into obscurity, the Smash Bros. community continues to keep her memory strong, thanks to a pro scene that has kept her front and center. 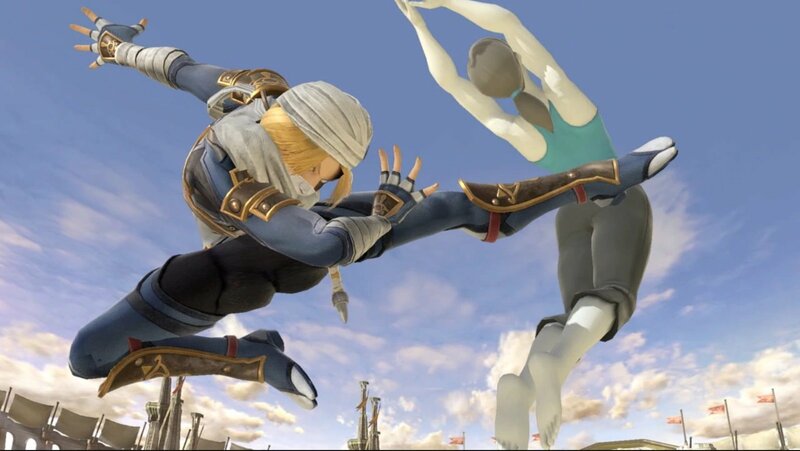 Sheik moves swiftly, able to get around fast and exercise great agility. She's only gotten faster in the new game, with her dash speed upped significantly. Her aerials are also slightly better. Needle Storm (Neutral B): Sheik can hold up to six needles and fire them off at will. They're effective projectiles both on the ground and in the air, where they inflict minor damage. Vanish (Up B): Sheik vanishes and reappears in a direction of the player's choice. While this can be used for recovery, the actually vanishing spot deals significant damage if Sheik can connect. Burst Grenade (Side B): Sheik lobs up a grenade, which explodes, similar to Zelda's Din's Fire. If it explodes, it can deal heavy damage, but because Sheik holds the trigger, the move can be interrupted. Bouncing Fish (Down B): This is one of Sheik's most reliable moves, where she performs a front flip and connects with a powerful kick. Once she connects, she can bounce back and land on her feet safely. While it doesn't have Meteor Smash properties, Bouncing Fish deals heavy knockback and works as a great finisher on recovering opponents. And while the startup is slower than it was in Smash 4, the knockback is even bigger now! Sheikah Dance (Final Smash): Sheik gets an all-new Final Smash, in which she dashes forward and hits any opponents in front of her with a barrage of dagger swipes, KO-ing most opponents. Sheik is a tricky character, but can be played in a variety of ways. Her Needle Storm and Burst Grenade makes her an effective zoning character. Unfortunately, Needle Storm operates notably slower than the previous Smash Bros. game, so those looking to use Sheik will need a little more time to get those six needles prepped. Sheik can also mix things up in close range, thanks to her above-average speed. It goes great with faster stats almost across the board, with her aerials and her Smash attacks now hitting faster and harder than before. A good dodge-heavy player can inflict plenty of damage before finishing with a well-placed Bouncing Fish. Smash 4 has had its share of Sheik mains. Among the top Sheik players in the world is James "VoiD" Makekau-Tyson. He went into an extensive analysis of Sheik shortly after the E3 2018 demo, showing off many areas where she's improved. This includes her down-air, her improved Vanish, and her improved Bouncing Fish, which is almost enough to offset the nerfs to her grabs. Want to see VoiD's Sheik at work? Let's go back to The Big House, where VoiD offered up a demonstration of what this character can do. How about Smash 4's other big-name Sheik main? Ramin "Mr. R" Delshad isn't quite as sold on his old character and is actually looking to move on, citing some key losses, as well as mechanical changes across the board that leave Sheik at a disadvantage. Also, she's lost some weight. Let's wrap up for now by taking a look at one of the top Melee players in the world. Justin "Wizzrobe" Hallett is known more for his Captain Falcon, but he's got a mean Sheik in Ultimate and he shows it off here. The timing on his Bouncing Fishes in that first game is superb. Super Smash Bros. Ultimate is out now on Nintendo Switch. We're still going through every single character, so be sure to check back in often for more profiles. For more information concerning Nintendo's latest Switch brawler, be sure to head over to Shacknews' Super Smash Bros. Ultimate walkthrough and guide.